* This is my column in BusinessWorld last February 19, 2018. The new Philippine tax law, the Tax Reform for Acceleration and Inclusion (TRAIN), has reduced personal income tax but it also created new economic distortions like higher oil and coal tax, higher sugar tax, and expanded VAT coverage. The actual pass-through effect of TRAIN 1 will be fully felt by March 2018 but the uncertainties and expectations of even higher prices have triggered many sectors to adjust the prices of their goods and services upwards last month so that the inflation rate rose to a high 4.0% in January 2018 vs 3.3% in full year 2017. We are still thinking about the implementation and implications of TRAIN 1 but then TRAIN 2 is already in Congress and the DoF and Malacañang hope that it will become a law before end-2018. TRAIN 2 is focused on two things: (a) reduction of the corporate income tax (CIT) from 30% to 25% by 2022, and (b) reduction of the various tax exemptions and tax holidays. The DoF recognizes that the Philippines has the highest CIT in the ASEAN, even higher than those by developed East Asian neighbors. This represents a disincentive to businesses unless they get various tax exemptions or reduction and thus, the plan to cut CIT. Levels of foreign direct investment (FDI) inward stock are also shown in the table below. These numbers show that the Philippines has (a) the highest CIT, (b) among the highest VAT or GST, (c) among the highest in withholding tax for dividends and interest income, and (d) has the highest withholding tax for royalties. I discussed these numbers in my recent talk at Deloitte’s TRAIN seminar last week February 15 at Ascott BGC. The DoF notes that the country’s Revenue Productivity, computed as [(tax revenue/GDP) / CIT rate], is very low, only 12% in 2015. This is similar to Indonesia’s 11% and far out from Singapore’s 21%, Vietnam’s 29%, and Thailand’s 31%. So aside from the Philippines Constitutional restrictions of 40% maximum equity participation of FDIs in many sectors, these high tax rates have contributed to its FDI inward stock being the lowest in the region. Well, there was significant improvement in recent years actually, the level has more than tripled in 2016 compared to 2010, but it is still low compared to what its emerging and developed neighbors get. TRAIN 2 should target a CIT of 20% or lower soon instead of 25% by 2022 coupled with reductions in various tax holidays and exemptions, for two important reasons. One is that regional and global tax competition is real and not fictional or drama. Singapore’s CIT of 17% is positioned near Hong Kong’s 16.5%. Vietnam’s CIT until 2015 was 22%, became 20% in 2016. Malaysia’s CIT until 2015 was 25%, became 24% in 2016. Japan’s CIT until 2014 was 25.5%, became 23.4/23.9 in 2016. And the US’s CIT until 2017 was 35%, became 21% in 2018. If the Philippines’ CIT would decline to 25% by 2022 and be on a par with Indonesia’s 25%, Indonesia may have cut its CIT to only 24% or lower by then. The big US cut in CIT has sent ripples to many countries around the world as many US companies located abroad are considering downsizing their operations there and strengthen their operations back in the US. These include some US companies in Singapore where the tax difference has declined from 18% (35% vs 17%) to only 4% (21% vs 17%). 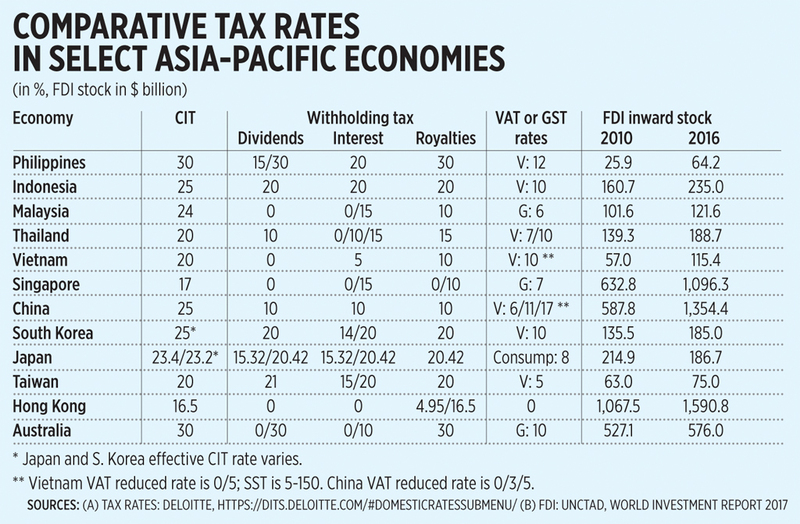 If Singapore would initiate a tax cut to 16% or 15% to dissuade these US and even European companies from going to the US, this will start a new round of tax competition within the ASEAN. Two, national taxes in CIT, withholding tax and VAT should significantly decline because the Duterte administration is serious in pushing hard its federalism agenda. Some of the soon federal states will also create their CIT, VAT, and withholding taxes on top of existing national taxes. This will be dangerous for businesses as they will pay high national taxes plus high state or regional taxes. If TRAIN 2 will aim for only 25% CIT and some future states will also impose another 5% CIT, the overall CIT can go back to 30%. The government should not be too tax-hungry because capital and people are more mobile these days. The distortions of TRAIN 1 of higher national taxes should be corrected by TRAIN 2 significant CIT cut. This will be good for entrepreneurship and job creation. BWorld 188, Estimating electricity price hikes resulting from TRAIN, March 10, 2018.